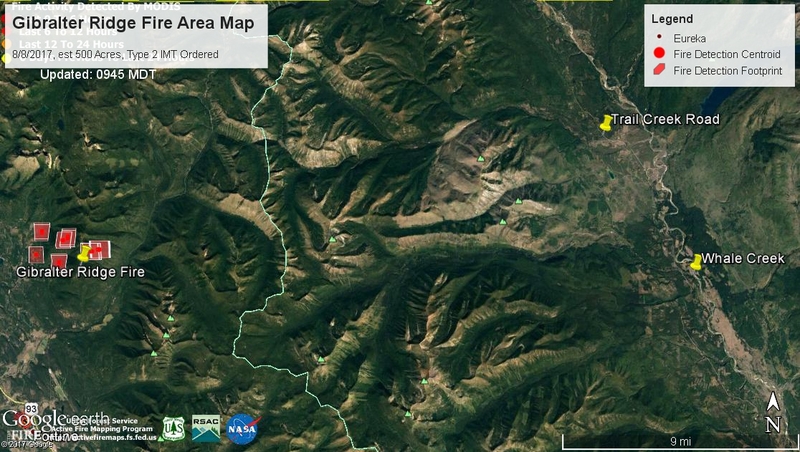 I see that according to Kootenai Dispatch WildCAD, there is a new large fire (estimated 500 acres) 7 miles east of Eureka in lower Graves Creek. It is about 20 miles due west of the North Fork Road at Whale Creek. A Type 2 Incident Management Team has been ordered. Rick Connell’s Western Montana IMT has been reserved, which means they will be assigned as soon as the inbriefing is set up. I can’t forecast the fire movement from what I know, but it would appear to be unlikely that it will progress northeast up Graves Creek and come down Trail Creek. I think it is more likely it will make runs to the east following lateral drainages. If it came over the top, it would run into the Wedge Canyon fire scar above Hornet. And I’m not sure how those regenerated stands would affect fire behavior. It would be easier for an overhead team to construct fuel breaks and fire out compared to heavy timber fuels. 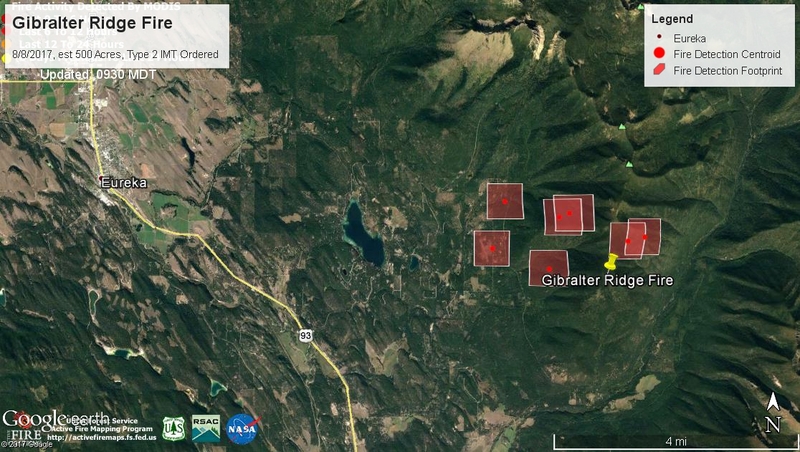 I attached the current Google Earth images showing the approximate fire location. My take is that this is a serious fire that is going to cover some ground. The North Fork needs to be alert, but it will be several operational periods before the fire is positioned to pose a direct threat to residents in the Valley. Lincoln, Bill, feel free to correct that assessment. Lincoln should be assigned with Connell as his Liaison Officer unless he has too much going on in Flathead County. If you want to keep up-to-date on this fire, check out InciWeb. And this is pretty cool. This fire has its own Facebook page. Gibralter Fire Area Map 8.8.2017 a.m.